Schooling Corporate Citizens examines the full history of accountability reform in the United States from its origins in the 1970s and 1980s to the development of the Common Core in recent years. Based in extensive archival research, it traces the origins and development of accountability reform as marked by key government- and business-led reports—from A Nation at Risk to No Child Left Behind and Race to the Top. 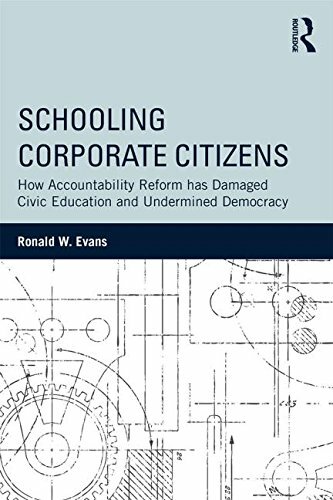 By using the lens of social studies and civic education as a means to understand the concrete impacts of accountability reforms on schools, Evans shows how reformers have applied principles of business management to schools in extreme ways, damaging civic education and undermining democratic learning. The first full-length narrative account of accountability reform and its impact on social studies and civic education, Schooling Corporate Citizens offers crucial insights to the ongoing process of American school reform, shedding light on its dilemmas and possibilities, and allowing for thoughtful consideration of future reform efforts.